NLB has a variety of accessories to help you manage flow and pressure, thus enhancing operator productivity and providing more protection while they work. Multi-Gun Valves feed two dump-style lances at once from a single pump unit. NLB has models to handle pressures from 4,000 to 20,000 psi (280 bar to 1,400 bar), as well as simple adapters and a 3-way adapter for UHP applications (40,000 psi, or 2,800 bar). Unloader valves let operators with dry shut-off style lances dump pressure by relaxing trigger pressure. They can also be used in automated applications to divert water back to the tank. Pressure reducing stations save you steps when a pump is remotely located, letting you adjust pressure where the water jetting is taking place instead of on the pump. Use with a 10,000 psi (700 bar) shut-off style lance to dump pressure. UL-452 is for flows up to 25 gpm (95 lpm); UL-904 for flows up to 50 gpm (190 rpm). Rugged stainless steel units let you reduce pressure when your pump is located far from the action. 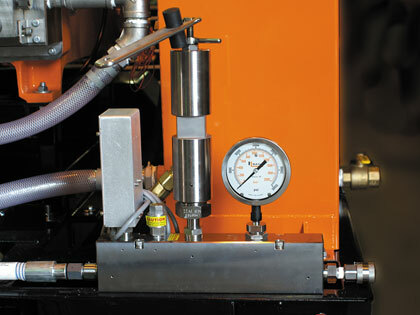 NLB has models for pressures up to 10,000 psi and 20,000 psi (700 bar and 1,400 bar).